OK, actually not so soon. During the last months I've put aside, through ups and downs, a lot of stuff, minding more about quantity then quality but I won't publish in SA3D complete sections of new subjects unless all the works will be properly refined and organized. In other words, a massive exposition of the new production will take place only when I will release the "version 2" of SA3D, an event that will more than double the size of this site and entirely change its look and feel. Nevertheless, knowing far too well how important is to keep alive the interest of the new as much as of the old visitors, I'm going to turn this page into a more vital, up-to-date, frequently refreshed review, replacing pictures on a regular basis with the new ones I'll render from time to time. Danguard is only apparently an easy subject to reproduce: to my surprise, I came across many pitfall during modelling which, by the way, took me nearly as much time as Gundam. 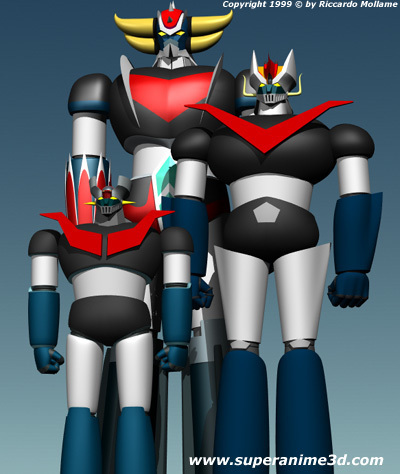 Its structure is a sort of combination between the "rounded" style of robots like Mazinger or Gaiking and the "cubic" style which can be recognized, at different levels, in robots like Gundam or Daitarn III. The process of modelling led me to carefully reconsider Danguard's design and consequently fully appreciate its beauty. Danguard is a modular robot: he builds up from a complicated transformation involving several components, initially assembled as an airplane. A not minor factor of difficulty came just from the request to make all the distinct parts mutually compatible in both configurations. 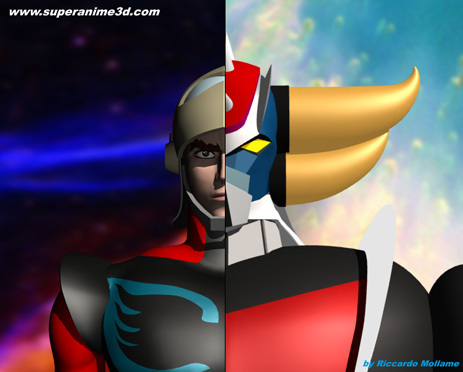 Could it be missing from SA3D colorful parade of Super Robots? Of course not. Gaiking is probably the most bizarre and pitoresque among all the creations of Go Nagai and definetly a challenge for a 3D modeler seeking new enterprises to measure his skills.As of other Super Robots, I had to resort to free interpretation to solve some of the more controversial and odd structural features of this subject, trying at the same time not to depart from the original "style" of the robot. Let's talk about meters. Dealing with Super Robots, it's an unavoidable topic, probably the one drawing the main curiosity but certainly the kind that would cause endless debates among fans, each one supporting his own favorite hero. What can we rely on? Informations and suggestions deducible directly from the cartoons? Datasheets reported by several anime publications and almost universally recognized (the WWW is an inexhaustible source for such things) by the fans? Or simply some common sense in establishing proportions by taking as sole term of comparison the average size of a human being? Whatever the choice, this is an excellent excuse to unleash once again the power of 3D fantasy. Hard to resist the temptation of creating the human conunterparts (i.e. pilots) of the steel giants: much harder to do it. Though cartoon characters representing human beings will never be a subject as demanding as people in flesh and blood, mainly because the poor definition of bodies and faces typical of cartoons, nevertheless building a "humanime" from scratch only with spline and patch polygonalisation is no joke at all. Unfortunately in case of human subject the lack of textures is much more noteworthy than in any other situation, so that it's almost unavoidable to have the impresssion of "Barbie looking" characters. This is definitely a weak side on schedule to be fixed as soon as possible: in the meanwhile, enjoy what you see. A note: some of the following pictures are not strictly unpublished across the WWW.